I am on my way to an annual shindig in Vancouver where I will be meeting up with some of my favourite bloggy friends Patti, Melanie, Sherry and Sue. Patti is a new addition to our group and isn’t in the photo below. 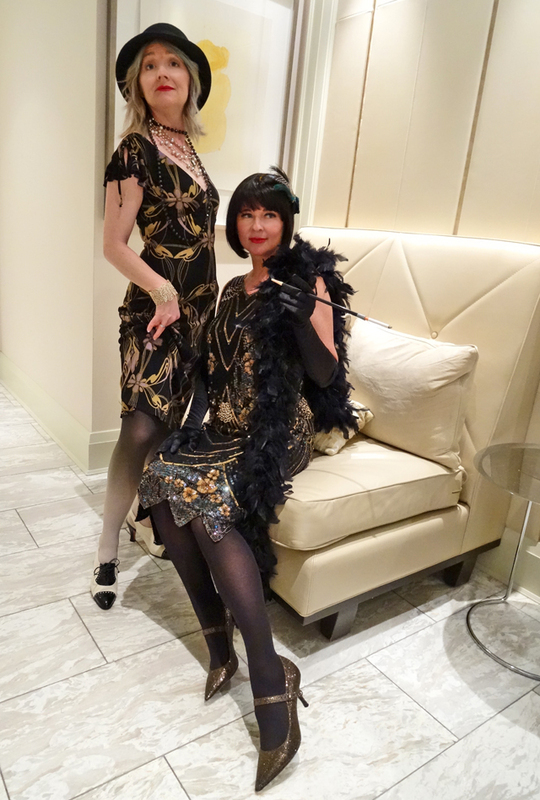 You may recall last year’s fun and crazy antics at our 1920’s dress up party. I’m looking forward to more fun, laughter, silliness and some serious gab sessions. Did I mention four of us are sharing accommodations? Party central! Packing for such a trip is always a nightmare. One has a bit of outfit performance anxiety when meeting with blogger royalty. Blogger meets-ups are a chance to really let your style freak fly with one caveat…comfortable footwear is a must, at least for myself. We walk everywhere. This greatly limits my satorial splendour. Another packing challenge is the Vancouver weather which is famously unpredictable and fickle. We are currently experiencing our first heat wave of the summer here in Ontario with temperatures near 40 C with the humidex today. Packing for the other side of the country which according to Environment Canada is 15-20 C cooler with the possibility of rain and cold evenings is a challenge, especially with my magic perimenopause ability to swing between freezing cold to red faced “look-out-she’s gonna-blow” mode. I managed to narrow down my outfit choices nonetheless and my bag is packed. I’ve decided to show off some of my personal vintage collection. Surprise! First up though I’m going to show you an outfit that didn’t make the cut. 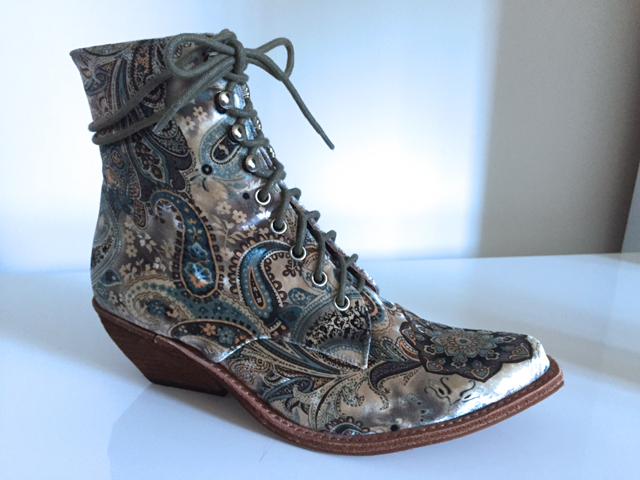 And yes…I own two pairs of these boots which are now on sale! in different styles because they are so comfy and cool. This is the other style I own. 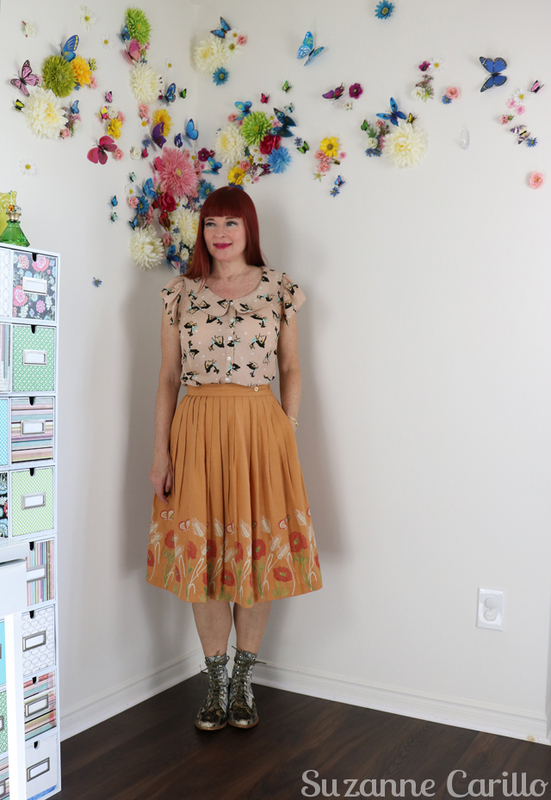 Okay…onto the first outfit for the blogger meet-up. This outfit is great with other footwear but I only have so much room in my suitcase. We will be thrifting and I need extra space for any possible new treasures I discover for my Etsy store. Outfit #2 What I’m wearing on the plane. Topper is my black pleather jacket. Notice the shoes…my favourite Clarks for pain free walking. These will be my go-to shoes for the trip. The black pleather jacket will also be my go-to jacket which works with all of my dresses. Vintage maxi cheongsam for our thrifting day at Talize. I won’t be taking these groovy baby blue boots with me. Instead I’ll be pairing it with the same Clarks sandals. Vintage Hawaiian barkcloth dress with train. I’m also bringing another pair of flat sandals in case my feet need a break from the other sandals. 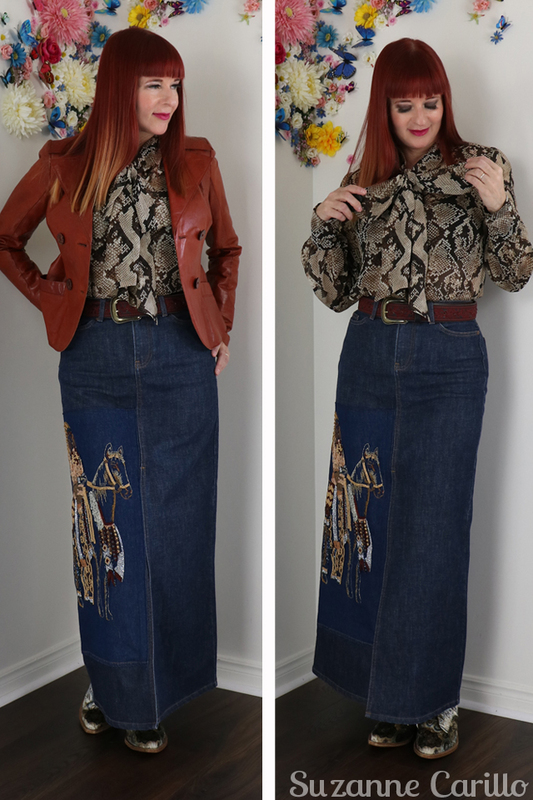 Western wear inspired with an altered maxi denim skirt. As a gal that lived for some years in Alberta I believe western wear never goes out of style. 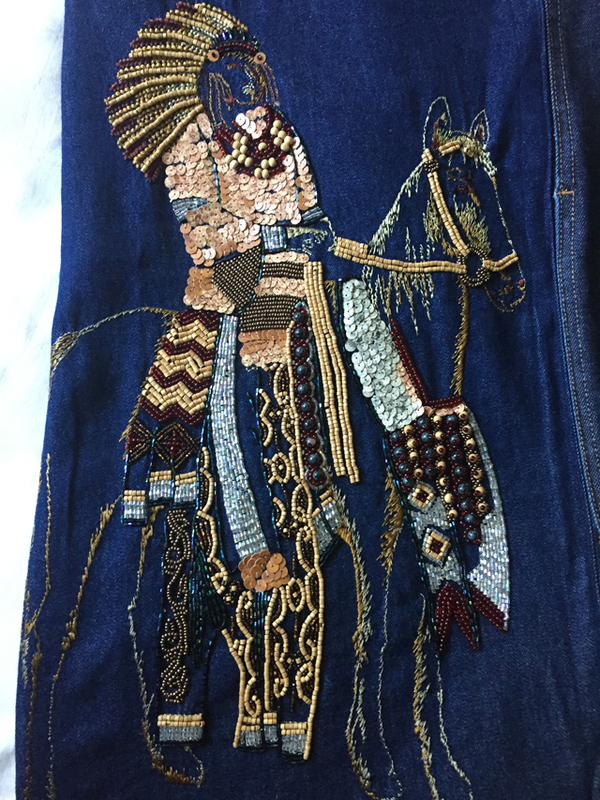 I found the Indian on horseback on another denim shirt and sewed it onto the denim maxi skirt. Isn’t it stunning? I will be adding my black pleather jacket and switching out the pink boots for the paisley western boots from Free People. We won’t be sitting too close to the front when I’m wearing this. I don’t need to be singled out by the comedian about how I showed up as a disco ball or the fact that I can be spotted from outer space. Been there done that and no-thank-you-very-much. Dress thrifted, necklace made by me. 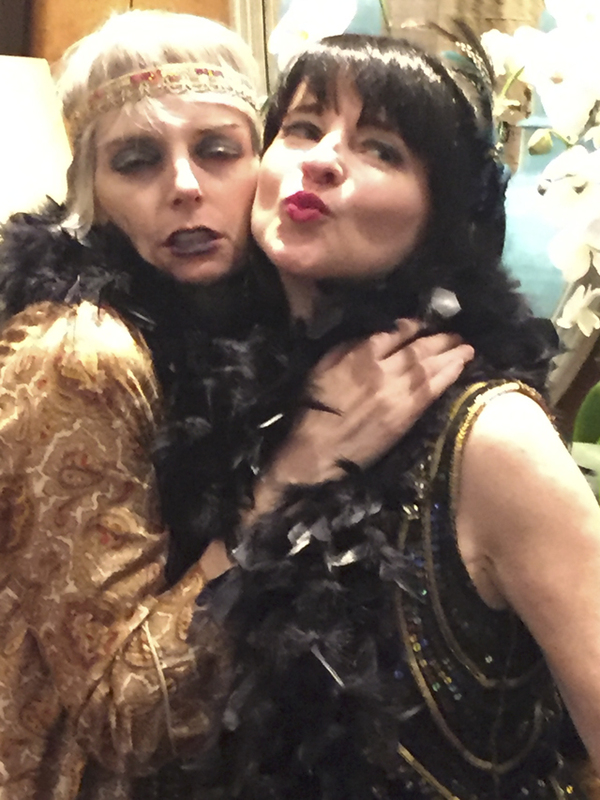 I won’t be giving any hints as to what our theme is this year but it’s going to be freakin’ fabulous! So if you want to follow along on my IG I will be posting live photos to my feed. Don’t miss out! I’m a fan of comfy clothing for the plane ride. Stretchy material like this thrifted maxi dress is my best friend for travelling. I’m an outfit packer and not a mix-and-match packer. I like to know exactly what I’ll be wearing each day. 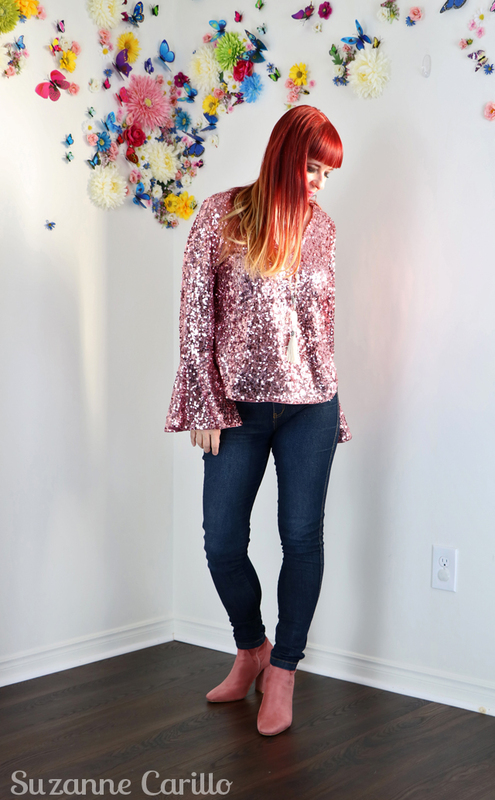 Are you an outfit packer or a mix-and-match packer? Be sure to follow along with our antics via my Instagram. Oh my!!! This is an occasion that promises joyousness at that highest level! Not only because of the fashion frenzy but the brilliant conversation among strong, curious, smart, funny and inspirational women!! My good fortune at having met and spent time with 3 of this group is a dear memory for this grateful non-blogger! 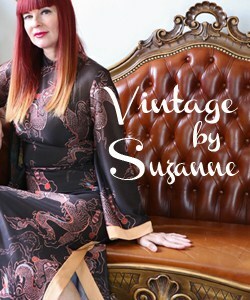 I’m really impressed by the wonderful dresses you’ve chosen to wear Suzanne. Each one resonates with your dynamic vintage fashionality ( 🙂 had to create a term!). I cruised through your Instagram posts and though I don’t subscribe I loved the review of some of your beautiful and thoughtful ensembles. Safe travels darling woman. I can’t wait for the photos and stories of this delicious rendezvous to pour from each of you!!! OOOOH…this is so good Suzanne! I was just giving my clothes the side-eye thinking none of them can compare with those in the wardrobes of the schtars visiting this weekend. And…HA…I’m right! Seriously just played a convo in my head moments ago ‘How does Suzanne rock those maxis like she does?’, thought me. This IS your look! 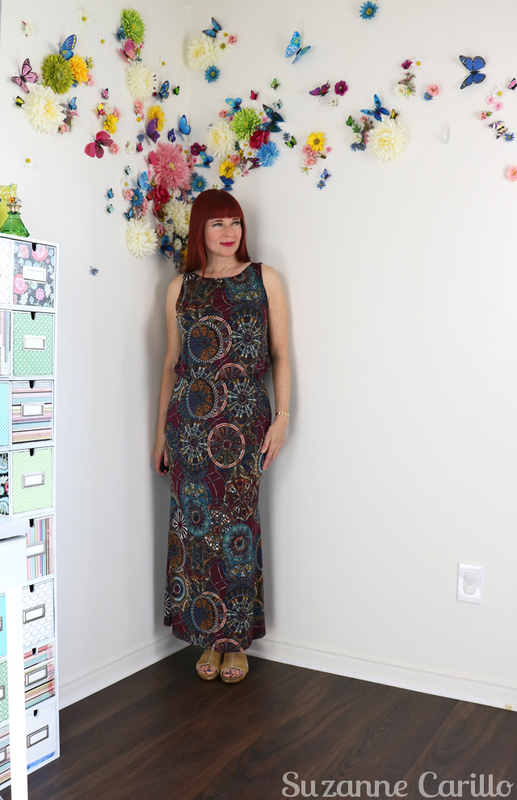 I’m not much shorter but I always feel kind of lost in a maxi…why is that? LOVE what you did with the denim skirt! It’s fabulous as is the whole look! The maxi issue is all in your head Sue. Especially since you can alter or make them fit you perfectly. It’s a question of modifying the way you see your reflection in the mirror. My bag is almost packed, Suzanne! You’re right about outfit anxiety!! I’m questioning almost everything in my suitcase now! 🙂 I can’t wait to see these outfits in person and, more than anything, to see YOU in person!! We’re going to have a blast! It was so good seeing you again Sherry! I really wish we could do these types of things once a month. What a fantastic array of outfits you’ve got lined up! I love the psych maxi and the Hawaiian dress and the skirt you pimped up with that crazy motif is just fabulous. I can just imagine the pressure – outfits have to be comfy, fabulous and look good from all angles just in case someone photographs you in action. 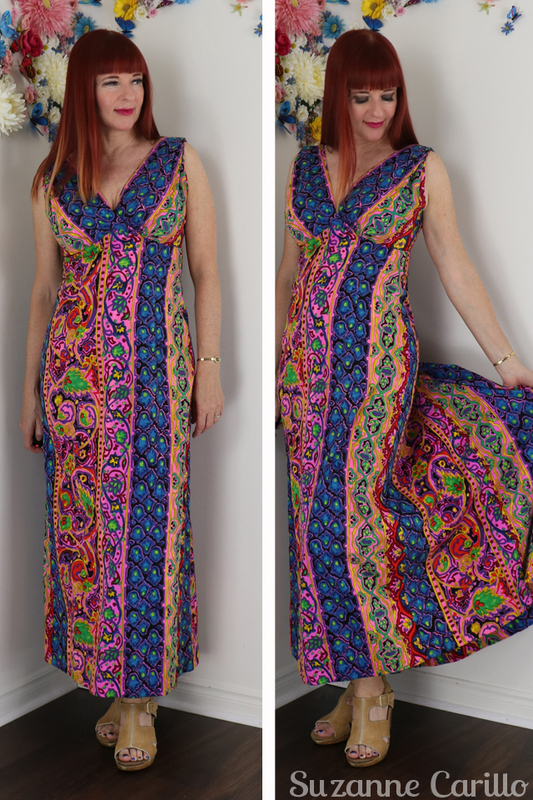 Where have you been hiding all these marvelous maxi dresses? Dresses like that are the perfect travel outfit – only one piece to pack, so figure flattering, and they make a bold style statement. I’m more of a “mix and match” packer as I never know from one day to the next what I will want to wear, and depending on where I am going, I may not know what I will be doing every day, so I need to be prepared for all possibilities. Safe travels, and have a blast with your fellow bloggers. I kind of wish I’d packed more cool weather outfits today. We did have a blast. I miss them all already. The worst for me is I thrift all the time when I travel and getting back home with all my new treasures is difficult. I actually had to buy a new massive suitcase this time just for my thrifted items. 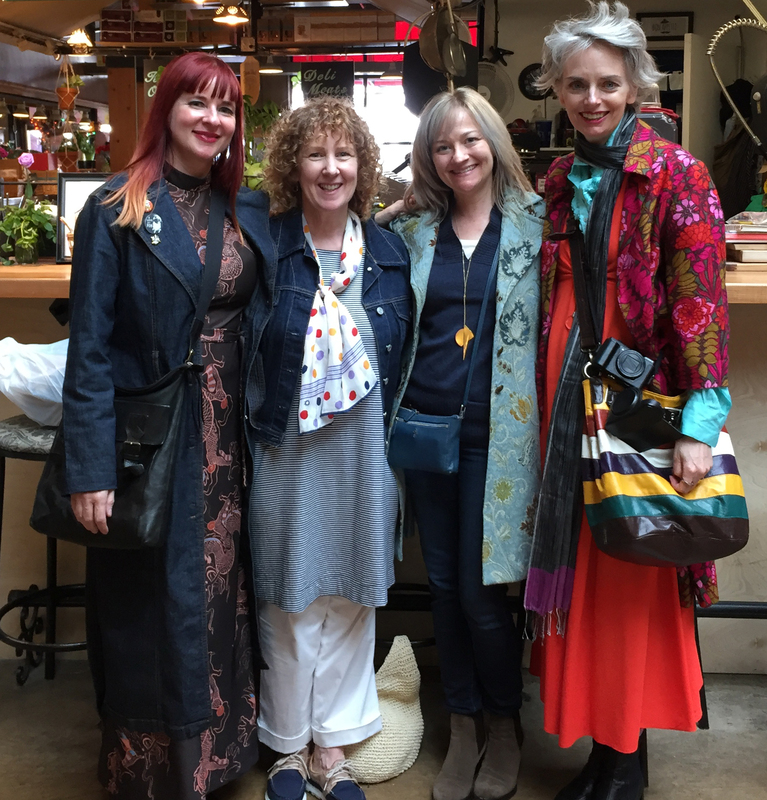 I know what you mean about anxiety in meeting blogger royalty! 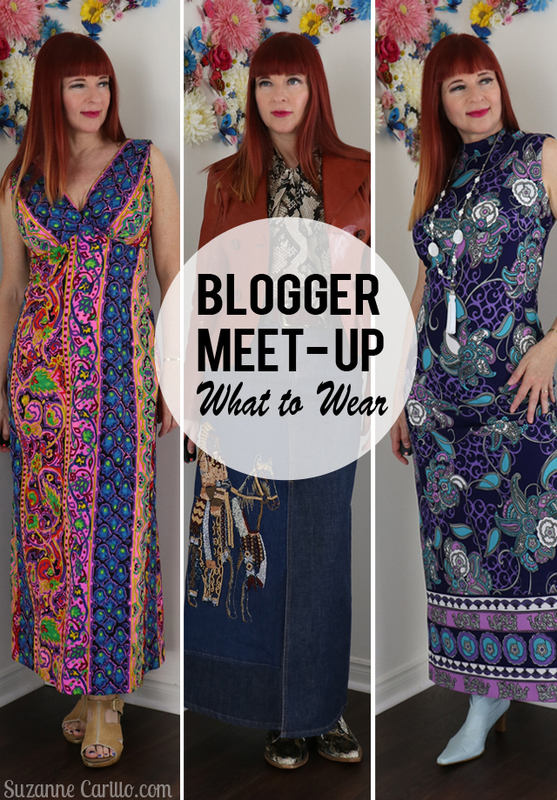 I met some top bloggers last week and was fretting big time about what to wear. 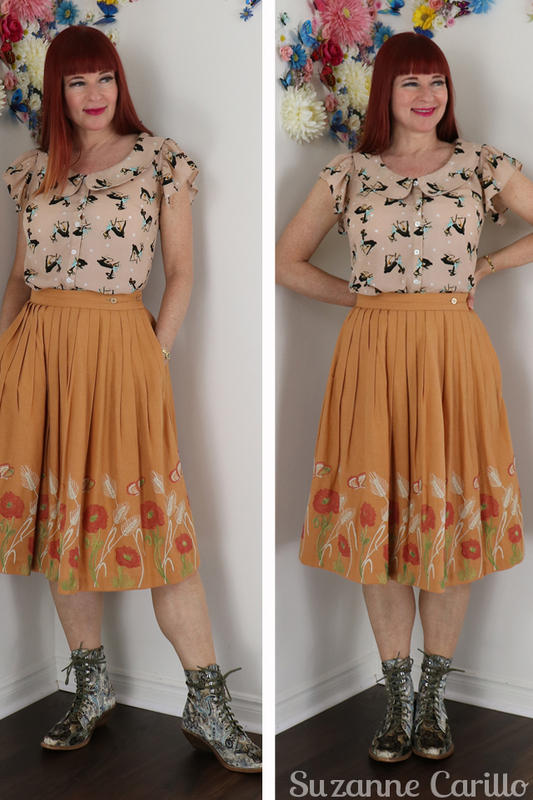 Your outfits look fab – you have a great style and no-one will ever be wearing the same as you! I hope you were pleased with your choices in the end Gail. You are going to have a blast, Suzanne!! I can’t wait to hear all about it! Well if that is considered OCD I’m full-on OCD, right down to the accessories. Pink sequins and all those gorgeous maxi dresses.!! You will be one stunning lady on the airplane. 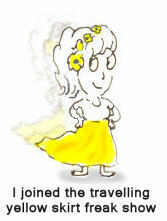 I am so excited for you to go on such a fabulous trip, with these amazing bloggers. I know you will have a wonderful time. You are packing stunning clothes, and it is very smart to bring only comfortable shoes. That is exactly what I would do. 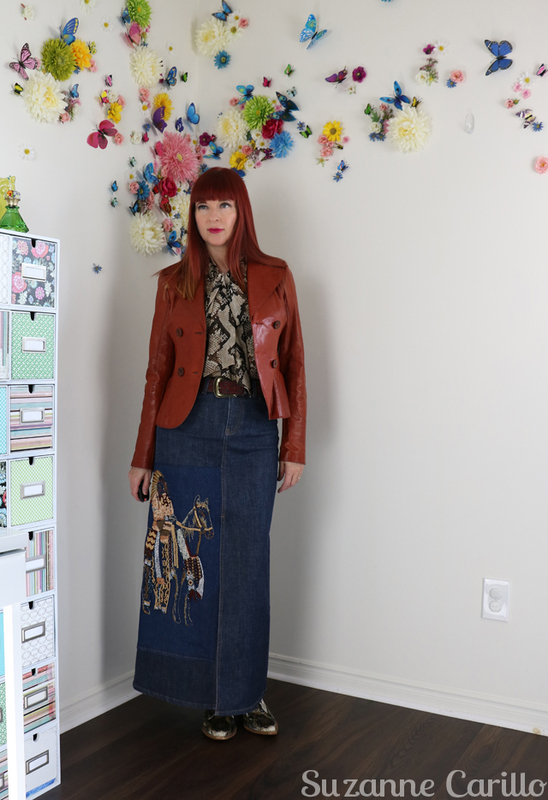 I love the way you added the denim appliqué to your maxi skirt ! I hope the weather is reasonable and that you have a wonderful time. Give my regards to your blogger friends most of whom I Follow and admire greatly. Have a great time Suzanne! Wow, you have a great eye for color.. love the colors in the outfits you have chosen! The rust leather jacket is gorgeous! Looks great with the denim skirt. I really love the colors in your floral dres you are wearing on the plane. Really all are great.. and I agree about the footwear. You always have to be comfy ( and stylish) when walking everywhere! I am an underpacker or sometimes i just mix and match depending on the event. I regret that I didn’t bring along an oversized sweater on this trip as it is quite cool. I was trying my best to be an under packer but wound up having to borrow a sweater or two from my Mom. Ahhh!! I recognize that fabric in the vintage Hawaiian dress!! My grandmother sewed herself a dress with that exact same fabric in the 1970’s for a trip to Hawaii. Then, last year, I visited her and we cleaned out her closets in search of vintage goodies to pass on to another generation. What an amazing find for both of us! That is incredible! The fabric is amazing so I’m not surprised your Mom was attracted to it. Thank you! It was enjoyable spending time with her and going through decades of fashion. That’s such a shame about Poshmark not delivering to Canada! 🙁 I hope they sort that out at some point. I don’t care so much for pants but I did bring one pair of jeans. I think it’s interesting to see how stressed we get about clothing. It really is an extension of ourselves. 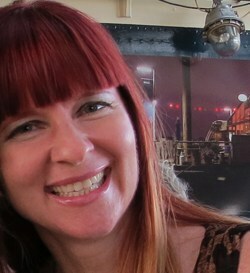 I am a mix and matcher but recently packed soooo many clothes for a trip to the beach and didn’t wear them all. As I grew up travelling in little planes and weight was such a restriction, this makes me ashamed. I think your outfits look stunning. You would have been such a stylish group. I enjoyed following you all on Ig when I checked in. It is always difficult to pack for other temperatures, I either under or over pack jumpers! Weather in BC is very unpredictable but overall we were pretty lucky. Ok, how many suitcases do you take, you fun girl? You know me and traveling, I’m definitely a mix and match packer, actually I’m so boring when it comes to travel packing or I guess you could say just practical. I loved seeing all your fun ideas but its been absolutely wonderful to catch up on your insta feed. That video of you three in the matching band uniforms is a keeper!!! 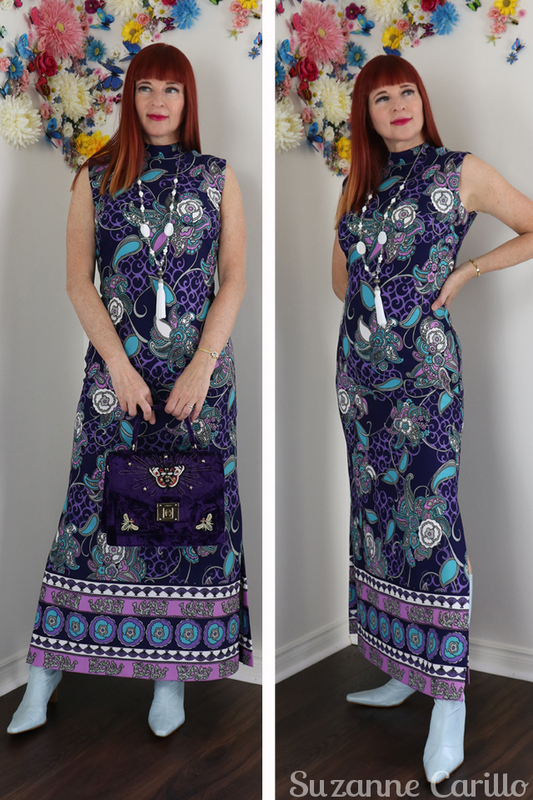 The blue and purple patterned vintage dress is gorgeous!! All my favorite colors to wear. I can definitely imagine that there’s a lot of thought that goes into packing when you’re going to be hanging out with all the other fabulous ladies of blogging and fashion! How cool to see your prepared looks. I’m a mix-and-match packer. Especially unpredictable weather and unforeseen circumstances may mess up all possible plans and ideas I might have had about what to wear when. So sometimes I end up using only a few items that I brought, over and over, while the rest turns out not to fit the bill, due to it being much more hot, cold or wet than anticipated.